Kru Dee's Baldwin Park Submission Wrestling Tournament | MMA Fighting Events Videos Techniques UFC Fight Picks and News. MMA fans know that grappling/wrestling and submissions are a big aspect of the sport. Last Saturday, August 28th Dee Martinez from Team Judo-Box held a backyard boogie submission grappling tournament in Baldwin Park, California. Dee Martinez puts these together a few times a year to give area grapplers an opportunity to compete and test their submission grappling skills. Saturday's event wasn't huge, but the excitement definitely was as submission fighters worked hard to takedown and submit their opponent. Our Chingasos MMA crew was there to document the event with some video and photos. 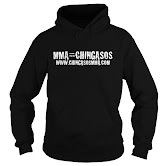 You can check out the photo album on the Chingasos MMA Facebook page. Here are some of the videos to give you a taste of the submission grappling action that went on that day.